Join the discussion on our forums! Come discuss Wartbringer over in our dedicated Wartbringer discussion topic. Easy to combo but probably not worth it in the end. Anyone remember pre-nerf Leper Gnome? This is that but better: one can target anything with its damage and it's a Battlecry. The Coin exists. Zap as well as other new cards that make this hilariously easy to play also exist. This card is good. This is literally Murkspark Eel, -1 cost but -2 health for spell-heavy decks. This is far from a bad card and is statted for tempo/aggro. This is currently a sleeper and will see play. it's not on the same powerlevel of pre-nerf leper gnome, since you need to play at least 2 spells before playing this card (99% of the time this is going to be dropped after turn 2). Leper gnome was strong because it contested the opponent 2 drop while pushing face damage at the same time, at no cost whatsoever. I don't think this card is bad, but it definetely is no pre-nerf Leper gnome. I don't understand comparing this to Leper Gnome at all. 2 damage to the enemy's face on deathrattle is not the same as deal 2 damage to anything you want on battlecry, conditionally. easy to trigger, but not really worth it. it generates minimum value when you're dumping your spels (with Frog Spirit for instance) but outside of that it'S a dead card and 2-damage on a stick for 1-mana just really isn't something to write home about. 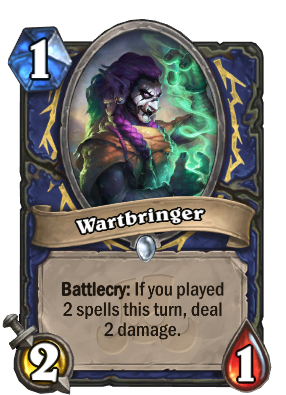 Very easy to trigger since shaman has a lot of cheap spells and since shaman wants to overload for the new weapon this will just add some extra damage to Shaman's burn list. Well, wording says "played" so no Electra or Zentimo combos.